… Stays with you forever. It feels like months ago, or maybe just yesterday, or maybe even that I dreamed it, but finals week was just last week. Less than seven days ago I was in Rome, typing furiously on my last paper due and studying harder for my upcoming tests. I was mentally saying goodbye to every room I walked out of that I would never walk in again, memorizing the streets of the Eternal City so that even when I return later, I will know that city well. And here I am, sitting on my couch in Minnesota, dogs curled at my feet and a homemade meal in my belly. I admit I was too busy last week to write a blog post, so here you get my recollection post. 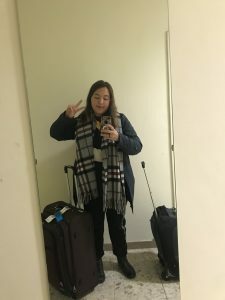 Half of the study abroad experience is how it feels when you come back, so I’d like to share with you what it’s like, coming back from some of the best times of your life. It’s weird, I’ll tell you that. Some of my friends are experiencing reverse culture shock – American things are so loud, so big, so similar and yet so different. Every day for four months we lived knowing that the culture we were in wasn’t our own, so we had to be careful and aware of making mistakes, and it’s hard to shake that habit, even when we know we’re back in our home country. Some of my friends are living life brighter than they did before. Most every day we reminisce and share photos, talk about things we said or did to the people around us that linked to study abroad. For example, I can’t help but say ‘grazie’ when a waiter puts my food in front of me at a restaurant, a habit I should be breaking and say ‘thank you’ instead. But it it is also really nice, to come home and go to Target in your sweatpants and hoodie and have nobody give you a second glance, or to raid the fridge, or to just lounge about all morning without being roused by the construction workers sounding like they’re drilling holes in your ceiling ( thanks, JFRC). People in your life who have studied abroad talk about their experiences with you, and although you can never really share it with people that weren’t there with you, hearing other people’s adventures and stories feel more real because you do the same thing, telling what you did to an audience that can imagine it. My friend Mark likes to joke that he was only studying abroad for the Instagram pics, and sometimes I felt like I was doing amazing things just to say I did, but those sorts of feelings are okay to have. Everyone at the J-Force, whether they’re still traveling over Europe or went home on the group flight alongside me, is learning to think about their experience in new and different lights. I for one don’t shut up about it, which isn’t a bad thing. My dad brought home gyros, and I got into a long tangent about my time in Greece, and how different the food was to American Greek food, a friend of mine is studying abroad in Austria next semester so I gave her all the apps and tips and tricks I learned, and so on, and so on. I really, really encourage everyone to study abroad, even more so now that I’m not abroad – I can see how it’s changed me, how amazing it was, how influential those short, short months will have on the rest of my life. Even if you think your major or course load won’t allow it, there are plenty of J-Term and Summer opportunities – or, heck, don’t go to a Loyola Campus. Find a study abroad program that will take you to somewhere you need to go, and transfer the credits. Business student? Go to London. Physics? You can make it work, early in your academic career. Talk to someone in the study abroad office, and just see what you can do. and so, so much more. I miss Rome, I miss constantly seeing my friends, and I miss the freedom of study abroad, the beauty of Italy and the diversity of Europe. Go. See. Do. And as always, if you have any questions, let me know. I’d be happy to talk! Thus wraps up the ‘pasta’ part of my journey. Next month: ‘Peking Duck’!